Falconry, the practice of hunting with falcons and hawks, began over 4,000 years ago, spread throughout Europe, Asia and the Middle East, and is one of the world’s oldest sports. Nature invariably deals a harsh hand, and seventy percent of raptor young starve in the wild during their first year. While falconry began as a practical way to provide food for the falconer, it greatly increases the longevity of the bird as well. For example, barring accident and disease (a major "if"in a bird's life! ), a red-tailed hawk can expect to live about 15 years in the wild, while a sheltered, regularly fed and exercised red-tail may live more than twice as long. 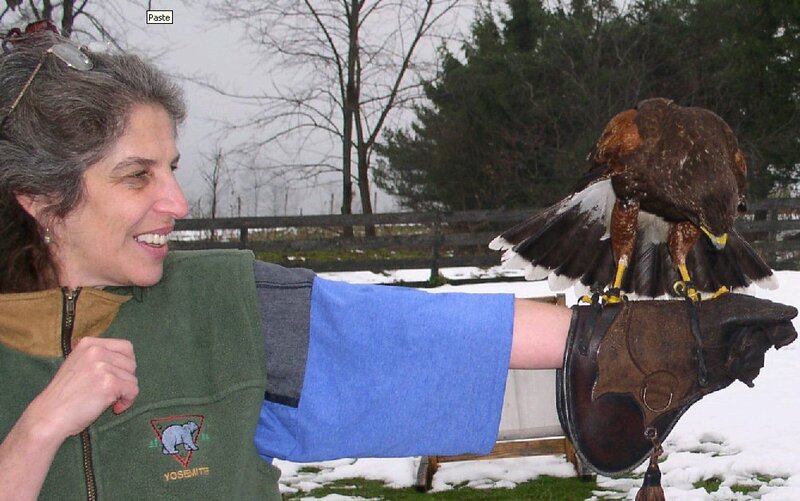 Wendy with Harris Hawk, Steve with Red-Tail, Mark lets Alex feel feather texture of Eagle Owl. 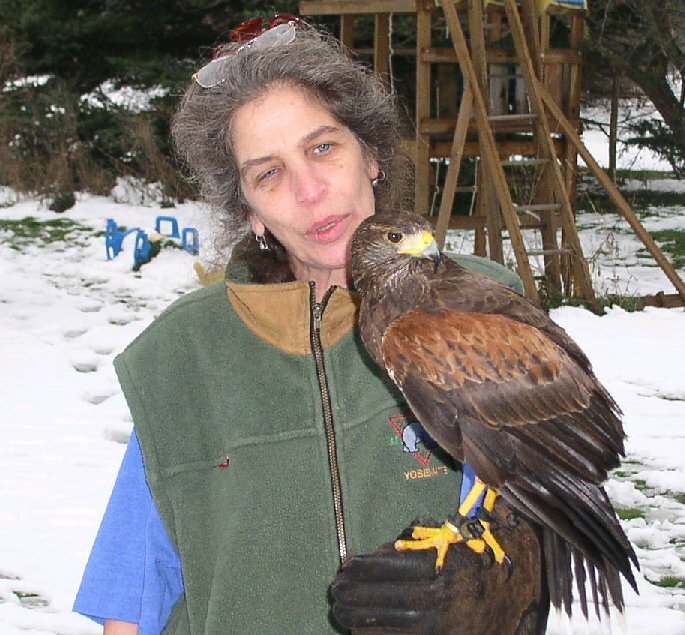 Falconers worked with scientists to save the Peregrine Falcon, the fastest animal on earth, and the bald eagle. DDT, a pesticide formerly used in agriculture in the U.S., worked its way into the food chain and into our waters through runoff, showing up in many of the birds and small rodents which falcons eat. In the pernicious manner in which such factors manifest themselves in nature, the higher place in the food chain an animal occupied, the higher the concentration of DDT. The devastating effect on falcons and eagles was a thinning and weakening of their egg shells, which would often collapse under the weight of the nesting parent, resulting in species-threatening, low birth rates. Falconers alerted scientists that they were discovering this in the wild, and then provided money and programs to help breed the endangered birds to help restore their numbers in the wild. Alex, Wendy and Steve spent three days at “Talons – A Birds of Prey Experience”, in Earlville, in Central New York, where Master Falconers Mark and Lorrie Westman introduced us to falconry, and taught us about hawks, falcons and owls, their behavior, life factors and environments. We were so enthralled, we look forward to taking the State Falconry Apprentice licensing exam in the Spring. It was a fascinating experience we recommend to all animal lovers.